The documentation for the Qt library is written in-line in the .cpp files by the developers themselves. The documentation team revises the documentation to ensure that it is accurate and usable, and to provide quality control. The documentation team also writes the larger texts, such as the class descriptions that introduce a class along with the concepts the class uses, as well as introducing the functions and properties that the class provides. The documentation focuses on the API rather than the internals, since we make great efforts to keep our API consistent and compatible with each new version, but we may change the internals considerably to improve performance and enhance functionality. The Qt's Classes page lists every class in Qt's public API, and consists of several hundred classes. The Qt's Main Classes page lists the classes you're most likely to use most often, and provides a much shorter and more managable list than the All Classes list. The Grouped Classes page presents a list of groups, each of which leads to a list of related classes, for example, the Advanced Widgets list. The Class Inheritance Hierarchy page presents a list of classes in terms of the hierarchy of Qt classes. 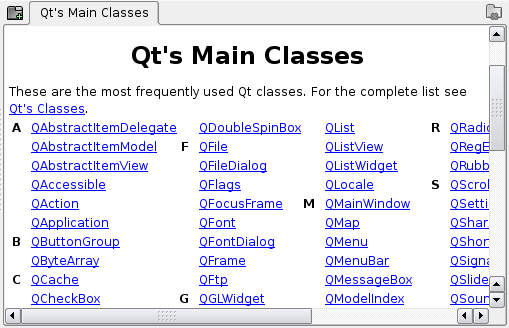 The Member Function Index page lists all the functions provided by Qt classes, each one with links to the class(es) in which it appears. No matter where you find yourself in the Qt documentation, you will find extensive cross-referencing. Even snippets of example code contain clickable links, so that for example, if you come across a class declaration in a code example, the class name will be a clickable link to the class's documentation. In addition to the class documentation some of Qt's modules have extensive descriptions, and there are many overview documents which describe various aspects of the Qt library; all these are linked from the reference documentation home page. There are also two tutorials and numerous example programs in the examples subdirectory of the Qt distribution. Under Windows, Qt Assistant is available as a menu option on the Qt menu. On Unix, run assistant from an xterm. When you start up Qt Assistant, you will be presented with a standard main-window style application, with a menu bar and toolbar. Below these, on the left hand side is a navigation window called the Sidebar, and on the right, taking up most of the space, is the documentation window. By default, the Qt Reference Documentation's home page is shown in the documentation window. Qt Assistant works in a similar way to a web browser. If you click underlined text (which signifies a cross-reference), the documentation window will present the relevant page. You can bookmark pages of particular interest and you can click the Previous and Next toolbar buttons to navigate within the pages you've visited. Although Qt Assistant can be used just like a web browser to navigate through the Qt documentation set, Qt Assistant offers a powerful means of navigation that web browsers don't provide. Qt Assistant uses an intelligent algorithm to index all the pages in the documentation sets that it presents so that you can search for particular words and phrases. To perform an index search, click the Index tab on the Sidebar (or click Ctrl+I). In the 'Look For' line edit enter a word, e.g. 'homedirpath'. По мере ввода, находятся и подсвечиваются слова в списке под полем редактирования. If the highlighted text matches what you're looking for, double click it, (or press Enter) and the documentation window will display the relevant page. You rarely have to type in the whole word before Qt Assistant finds a match. Заметьте, что для некоторых слов может быть более одной возможной страницы соответствия. Qt Assistant также предоставляет полнотекстовый поиск для поиска специфических слов в документации. Documents with the highest occurrences of the word that you are looking for appear first, and every occurrence of the word within the documentation is highlighted. Qt Assistant can be customized by creating profiles, a collection of documentation. Profiles can be created for your own use, or for an application you will distribute. With profiles, you can select which documentation you want the end user of your application to be able to view. The Contents tab presents a tree view of the documentation sets that are available. If you click an item, its documentation will appear in the documentation window. If you double click an item or click a '+' sign to the left of an item, the item's sub-items will appear. Click a sub-item to make its page appear in the documentation window. Click a '-' sign to the left of an item to hide its sub-items. The Index tab is used to look up key words or phrases. See The One-Minute Guide to Using Qt Assistant for how to use this tab. The Bookmarks tab lists any bookmarks you've made. Double click a bookmark to make its page appear in the documentation window. The Bookmarks tab has a New Bookmark button and a Delete Bookmark button at the bottom. Click New Bookmark to bookmark the page that is showing in the documentation window. Click a bookmark in the list, then click Delete Bookmark to delete the highlighted bookmark. The Search tab provides full text search of all the documents. See Full Text Searching for more information about this feature. If you want the documentation window to use as much space as possible, you can easily hide or show the Sidebar. If the Sidebar is showing, press Ctrl+T, Ctrl+I, Ctrl+B, or Ctrl+S to hide it. If the Sidebar is hidden, press Ctrl+T to show it on the Contents tab, or press Ctrl+I to show it on the Index tab (with the focus in the 'Look For' line edit box), or press Ctrl+B to show it on the Bookmarks tab, or press Ctrl+S to show it on the (full text) Search tab. The Sidebar is a dock window, so you can drag it to the top, left, right or bottom of Qt Assistant's window, or you can drag it outside Qt Assistant to float it. The documentation window offers a feature for viewing documentation by enabling you to create tabs for each documentation page that you view. Click the Add Tab button and a new tab will appear with the page name as the tab's caption. This makes it convenient to switch between pages when you are working with different documentation. You can delete a tab by clicking the Close Tab button located on the right side of the documentation window. The toolbar provides fast access to the most common actions. Previous takes you to the previous page. The menu option is Go|Previous and the keyboard shortcut is Alt+Left Arrow. Next takes you to the next page. The menu option is Go|Next and the keyboard shortcut is Alt+Right Arrow. Home takes you to the home page (normally the home page of the Qt Reference Documentation). The menu option is Go|Home and the keyboard shortcut is Ctrl+Home. Copy copies any selected text to the clipboard. The menu option is Edit|Copy and the keyboard shortcut is Ctrl+C. Find in Text invokes the Find Text dialog. The menu option is Edit|Find in Text and the keyboard shortcut is Ctrl+F. Print invokes the Print dialog. The menu option is File|Print and the keyboard shortcut is Ctrl+P. Zoom in increases the font size. The menu option is View|Zoom in and the keyboard shortcut is Ctrl++. Zoom out decreases the font size. The menu option is View|Zoom out and the keyboard shortcut is Ctrl+-. What's This? 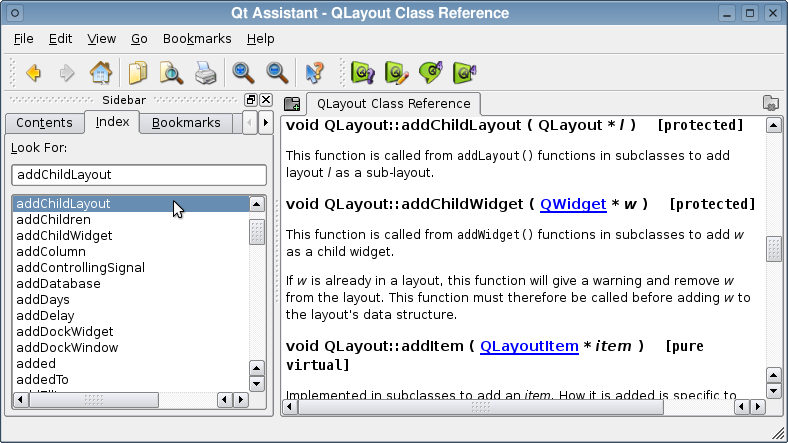 provides a description of a Qt Assistant feature. The menu option is Help|What's This? and the keyboard shortcut is Shift+F1. The remaining toolbar buttons are bookmarks and will vary depending on your configuration. File|Print invokes the Print dialog. Edit|Copy copies any selected text to the clipboard. Edit|Find in Text invokes the Find Text dialog. View|Zoom in increases the font size. View|Zoom out decreases the font size. View|Views|Sidebar toggles the display of the Sidebar. View|Views|Toolbar toggles the display of the Toolbar. View|Views|Line up lines up the toolbar buttons in the Toolbar. Go|Previous displays the previous page. Go|Next displays the next page. Go|home goes to the home page. This menu also has additional items; these are pre-defined bookmarks that vary depending on your configuration. Bookmarks|Add adds the current page to the list of bookmarks. This menu may have additional items, i.e. any bookmarks that you have already made. If you want to delete a bookmark go to the Bookmarks tab on the Sidebar. This dialog is platform-specific. It gives access to various printer options and can be used to print the current page. This dialog is used to find text in the current page. Enter the text you want to find in the Find line edit. If you check the 'Whole words only' checkbox, the search will only consider whole words, i.e. if you search for 'spin' with this checkbox checked it will not match 'spinbox', but will match 'spin'. If you check the 'Case sensitive' check box then, for example, 'spin' will match 'spin' but not 'Spin'. You can search Forward or Backward from your current position in the page by clicking one of the Direction radio buttons. Click the Find button to search (or search again), and click the Close button to finish. The wildcard (*) character cannot be used within quotes. The list of documents found is ordered according to the number of occurrences of the search text they contain, therefore those with the highest number of occurrences appearing first. Simply click any document in the list to display it in the document window. If the documentation has changed, i.e. if documents have been added or removed, Qt Assistant will reindex. Qt Assistant can be customized by adding and removing documentation from its documentation set. In addition, Qt Assistant introduces the profiles option, which enables its properties to change, for example, the default startup page, and application icon. When it is started without any options, Qt Assistant displays a default set of documentation. 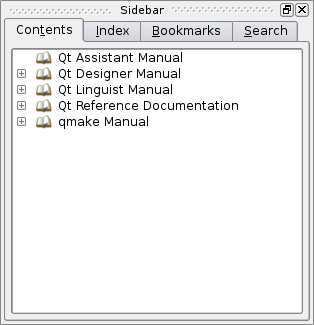 When Qt is installed, the default documentation set in Qt Assistant contains the Qt reference documentation as well as the tools that come with Qt, such as Qt Designer and qmake. In line one, we add the content file file.dcf. In line two, we start Qt Assistant. The default set will now be extended with the doc file file.dcf. In line three we remove the file file.dcf from the default documentation set so that subsequent use of Qt Assistant will not contain this file. The Documentation Content File must contain the documentation's table of contents and all important keywords for the index. In addition, it may inherit an icon for the documentation which is displayed in the Qt Assistant toolbar. You can also specify an extra directory path for additional images used in the documentation. Sections may be nested as deeply as necessary. All references should be related. Note that any keyword tags for a given section must appear before any sections nested within the given section. The paths in the refs attribute are always written Unix-style (forward slashes) and are relative to the location of the documentation content file itself. Since the introduction of the new root tag assistantconfig in the fileformat from Qt version 3.2.0, it is possible to specify multiple DCF tags in one file. Note that the old document contents file format, used up to Qt 3.2 is still valid. Qt Assistant Documentation - This property describes the location of the Qt Assistant documentation, which is used when the user requests help from the Search tab. The location is a directory relative to the location of the profile. The property name is assistantdocs. To define a profile, one needs to specify a Qt Assistant Document Profile, usually abbreviated .adp. The profile is an extension of the Documentation Content File described above. We add a profile tag containing property tags to the format. See the Simple Text Viewer example in the Qt distribution for a demonstration on how to use Qt Assistant with profiles for your own applications.